Item # 309902 Stash Points: 995 (?) This is the number of points you get in The Zumiez Stash for purchasing this item. Stash points are redeemable for exclusive rewards only available to Zumiez Stash members. To redeem your points check out the rewards catalog on thestash.zumiez.com. 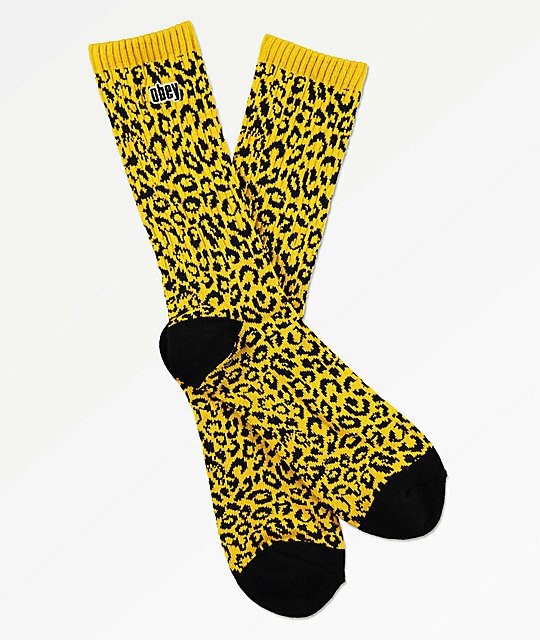 Outfit your feet in flashy style with the Obey Leopard Energy Yellow Crew Socks. These allover yellow leopard print socks come complete with an embroidered black and white logo script at the upper of each cuff for classic branded flair. Leopard Energy Yellow Crew Socks from Obey. Jacquard knit leopard print throughout with logo script on interior cuff.